Definition at line 1597 of file stdsoap2.h. Definition at line 1619 of file stdsoap2.h. Referenced by soap_accept(), and soap_init(). Definition at line 1615 of file stdsoap2.h. Definition at line 1737 of file stdsoap2.h. Referenced by http_parse(), http_parse_header(), soap_begin_recv(), soap_copy_context(), soap_dealloc(), soap_end_send(), soap_init(), and soap_try_connect_command(). Definition at line 1610 of file stdsoap2.h. Referenced by soap_element(), soap_init(), and soap_peek_element(). Definition at line 1701 of file stdsoap2.h. Referenced by soap_begin(), soap_begin_recv(), soap_copy_stream(), soap_get(), soap_getchar(), soap_getutf8(), soap_recv_raw(), and soap_tell(). Definition at line 1626 of file stdsoap2.h. Referenced by soap_copy_context(), soap_dealloc(), soap_init(), soap_malloc(), and soap_unlink(). Definition at line 1730 of file stdsoap2.h. Referenced by soap_begin(), soap_begin_recv(), soap_id_enter(), soap_in_ArrayOf_USCORExsd_USCOREstring(), and soap_malloc(). Definition at line 1719 of file stdsoap2.h. Referenced by soap_in_ArrayOf_USCORExsd_USCOREstring(), soap_peek_element(), and soap_putoffsets(). Definition at line 1718 of file stdsoap2.h. Referenced by soap_in_ArrayOf_USCORExsd_USCOREstring(), and soap_peek_element(). Definition at line 1717 of file stdsoap2.h. Referenced by soap_getelement(), soap_in_ArrayOf_USCORExsd_USCOREstring(), soap_in_ns2__checkRegExp(), soap_in_ns2__checkRegExpResponse(), soap_in_ns2__getDataResources(), soap_in_ns2__getDataTypeDef(), soap_in_ns2__getDataTypeDefResponse(), soap_in_ns2__getDataTypePattern(), soap_in_ns2__getDataTypePatternResponse(), soap_in_ns2__getDataTypeSynonyms(), soap_in_ns2__getDataTypeURI(), soap_in_ns2__getDataTypeURIResponse(), soap_in_ns2__getDataTypeURIs(), soap_in_ns2__getJavaLibraryVersionResponse(), soap_in_ns2__getLocation(), soap_in_ns2__getLocationResponse(), soap_in_ns2__getLocations(), soap_in_ns2__getLocations_(), soap_in_ns2__getMiriamURI(), soap_in_ns2__getMiriamURIResponse(), soap_in_ns2__getName(), soap_in_ns2__getNameResponse(), soap_in_ns2__getNames(), soap_in_ns2__getOfficialDataTypeURI(), soap_in_ns2__getOfficialDataTypeURIResponse(), soap_in_ns2__getResourceInfo(), soap_in_ns2__getResourceInfoResponse(), soap_in_ns2__getResourceInstitution(), soap_in_ns2__getResourceInstitutionResponse(), soap_in_ns2__getResourceLocation(), soap_in_ns2__getResourceLocationResponse(), soap_in_ns2__getServicesInfoResponse(), soap_in_ns2__getServicesVersionResponse(), soap_in_ns2__getURI(), soap_in_ns2__getURIResponse(), soap_in_ns2__isDeprecated(), soap_in_ns2__isDeprecatedResponse(), soap_in_PointerToArrayOf_USCORExsd_USCOREstring(), soap_in_std__string(), soap_match_array(), and soap_peek_element(). Definition at line 1724 of file stdsoap2.h. Referenced by soap_attr_value(), soap_clr_attr(), soap_copy_context(), soap_element_null(), soap_element_start_end_out(), soap_free_temp(), soap_init(), soap_peek_element(), soap_set_attr(), soap_string_in(), and soap_wstring_in(). Definition at line 1738 of file stdsoap2.h. Referenced by http_parse(), http_parse_header(), http_response(), soap_dealloc(), and soap_init(). Definition at line 1618 of file stdsoap2.h. Referenced by soap_bind(), and soap_init(). Definition at line 1798 of file stdsoap2.h. Referenced by frecv(), fsend(), soap_copy_context(), soap_copy_stream(), and soap_init(). Definition at line 1624 of file stdsoap2.h. Referenced by soap_block_size(), soap_copy_context(), soap_end_block(), soap_end_send(), soap_first_block(), soap_free_temp(), soap_getdime(), soap_in_ArrayOf_USCORExsd_USCOREstring(), soap_init(), soap_new_block(), soap_next_block(), soap_peek_element(), soap_pop_block(), soap_push_block(), soap_save_block(), and soap_size_block(). Definition at line 1703 of file stdsoap2.h. Referenced by soap_body_begin_in(), soap_element(), soap_element_begin_in(), soap_element_end_out(), soap_ignore_element(), soap_in_ArrayOf_USCORExsd_USCOREstring(), soap_in_ns2__checkRegExp(), soap_in_ns2__checkRegExpResponse(), soap_in_ns2__getDataResources(), soap_in_ns2__getDataResourcesResponse(), soap_in_ns2__getDataTypeDef(), soap_in_ns2__getDataTypeDefResponse(), soap_in_ns2__getDataTypePattern(), soap_in_ns2__getDataTypePatternResponse(), soap_in_ns2__getDataTypesId(), soap_in_ns2__getDataTypesIdResponse(), soap_in_ns2__getDataTypesName(), soap_in_ns2__getDataTypesNameResponse(), soap_in_ns2__getDataTypeSynonyms(), soap_in_ns2__getDataTypeSynonymsResponse(), soap_in_ns2__getDataTypeURI(), soap_in_ns2__getDataTypeURIResponse(), soap_in_ns2__getDataTypeURIs(), soap_in_ns2__getDataTypeURIsResponse(), soap_in_ns2__getJavaLibraryVersion(), soap_in_ns2__getJavaLibraryVersionResponse(), soap_in_ns2__getLocation(), soap_in_ns2__getLocationResponse(), soap_in_ns2__getLocations(), soap_in_ns2__getLocations_(), soap_in_ns2__getLocationsResponse(), soap_in_ns2__getLocationsResponse_(), soap_in_ns2__getMiriamURI(), soap_in_ns2__getMiriamURIResponse(), soap_in_ns2__getName(), soap_in_ns2__getNameResponse(), soap_in_ns2__getNames(), soap_in_ns2__getNamesResponse(), soap_in_ns2__getOfficialDataTypeURI(), soap_in_ns2__getOfficialDataTypeURIResponse(), soap_in_ns2__getResourceInfo(), soap_in_ns2__getResourceInfoResponse(), soap_in_ns2__getResourceInstitution(), soap_in_ns2__getResourceInstitutionResponse(), soap_in_ns2__getResourceLocation(), soap_in_ns2__getResourceLocationResponse(), soap_in_ns2__getServicesInfo(), soap_in_ns2__getServicesInfoResponse(), soap_in_ns2__getServicesVersion(), soap_in_ns2__getServicesVersionResponse(), soap_in_ns2__getURI(), soap_in_ns2__getURIResponse(), soap_in_ns2__isDeprecated(), soap_in_ns2__isDeprecatedResponse(), soap_in_PointerToArrayOf_USCORExsd_USCOREstring(), soap_in_PointerToSOAP_ENV__Code(), soap_in_PointerToSOAP_ENV__Detail(), soap_in_PointerToSOAP_ENV__Reason(), soap_in_PointerTostd__string(), soap_in_SOAP_ENV__Code(), soap_in_SOAP_ENV__Detail(), soap_in_SOAP_ENV__Fault(), soap_in_SOAP_ENV__Header(), soap_in_SOAP_ENV__Reason(), soap_in_std__string(), soap_inbyte(), soap_indateTime(), soap_indouble(), soap_infloat(), soap_inint(), soap_inliteral(), soap_inlong(), soap_inLONG64(), soap_inshort(), soap_instring(), soap_inULONG64(), soap_inunsignedByte(), soap_inunsignedInt(), soap_inunsignedLong(), soap_inunsignedShort(), soap_inwliteral(), soap_inwstring(), soap_peek_element(), soap_revert(), soap_string_in(), soap_value(), soap_wstring_in(), and soap_xop_forward(). Definition at line 1710 of file stdsoap2.h. Referenced by soap_begin_recv(), soap_copy_stream(), soap_end_recv(), soap_flush(), soap_getchunkchar(), soap_getdime(), soap_print_fault_location(), soap_recv(), soap_recv_raw(), soap_send_raw(), and tcp_gethost(). Definition at line 1699 of file stdsoap2.h. Referenced by soap_begin(), soap_begin_recv(), soap_begin_send(), soap_copy_stream(), soap_end_recv(), soap_flush(), soap_getchunkchar(), soap_getdime(), soap_print_fault_location(), soap_recv(), soap_recv_raw(), soap_send_raw(), and soap_tell(). Definition at line 1700 of file stdsoap2.h. Referenced by soap_begin(), soap_begin_recv(), soap_begin_send(), soap_copy_stream(), soap_end_recv(), soap_getchunkchar(), soap_getdime(), soap_print_fault_location(), soap_recv(), soap_recv_raw(), and soap_tell(). Definition at line 1771 of file stdsoap2.h. Referenced by soap_init(), and soap_push_ns(). Definition at line 1770 of file stdsoap2.h. Definition at line 1816 of file stdsoap2.h. Referenced by soap_copy_context(), soap_done(), soap_double2s(), soap_float2s(), soap_init(), soap_s2double(), and soap_s2float(). Definition at line 1807 of file stdsoap2.h. Definition at line 1808 of file stdsoap2.h. Definition at line 1702 of file stdsoap2.h. Referenced by soap_begin(), soap_begin_recv(), soap_copy_stream(), and soap_get(). Definition at line 1733 of file stdsoap2.h. Referenced by soap_begin_recv(), soap_copy_stream(), soap_getchunkchar(), and soap_recv_raw(). Definition at line 1732 of file stdsoap2.h. Referenced by soap_begin_recv(), soap_begin_send(), soap_copy_stream(), soap_flush_raw(), and soap_recv_raw(). Definition at line 1625 of file stdsoap2.h. Referenced by soap_copy_context(), soap_delete(), soap_done(), soap_end(), soap_init(), soap_link(), and soap_unlink(). Definition at line 1617 of file stdsoap2.h. Referenced by fsend(), soap_init(), and tcp_connect(). Definition at line 1614 of file stdsoap2.h. Referenced by soap_init(), and tcp_connect(). Definition at line 1773 of file stdsoap2.h. Definition at line 1775 of file stdsoap2.h. Definition at line 1774 of file stdsoap2.h. Definition at line 1772 of file stdsoap2.h. Referenced by soap_copy_context(), and soap_init(). Definition at line 1705 of file stdsoap2.h. Referenced by soap_begin(), soap_begin_count(), soap_begin_recv(), soap_begin_send(), soap_count_attachments(), soap_end_send(), soap_envelope_begin_out(), soap_envelope_end_out(), soap_recv(), soap_recv_raw(), soap_send_empty_response(), soap_send_raw(), soap_tell(), and tcp_connect(). Definition at line 1809 of file stdsoap2.h. Definition at line 1800 of file stdsoap2.h. Referenced by soap_copy_stream(), soap_done(), soap_init(), and tcp_connect(). Definition at line 1822 of file stdsoap2.h. Referenced by soap_begin_recv(), soap_begin_send(), soap_closesock(), soap_copy_context(), soap_copy_stream(), soap_done(), soap_end_recv(), soap_end_send(), soap_flush(), soap_init(), soap_recv_raw(), and soap_set_fault(). Definition at line 1806 of file stdsoap2.h. Definition at line 1760 of file stdsoap2.h. Referenced by soap_attachment(), soap_begin(), soap_begin_count(), soap_begin_recv(), soap_clr_dime(), soap_count_attachments(), soap_end_recv(), soap_end_send(), soap_envelope_begin_out(), soap_envelope_end_out(), soap_getdime(), soap_getdimehdr(), soap_init(), soap_putdime(), soap_putdimehdr(), soap_recv(), soap_set_dime(), and soap_set_dime_attachment(). Definition at line 1606 of file stdsoap2.h. Referenced by soap_attachment(), soap_envelope_end_out(), and soap_init(). Definition at line 1759 of file stdsoap2.h. Referenced by soap_attribute(), soap_begin_recv(), soap_element(), soap_element_end_in(), soap_element_end_out(), soap_element_start_end_out(), soap_getbase64(), soap_gethex(), soap_init(), soap_peek_element(), soap_putbase64(), soap_puthex(), soap_string_in(), soap_string_out(), soap_value(), soap_wstring_in(), and soap_wstring_out(). Definition at line 1605 of file stdsoap2.h. Referenced by soap_double2s(), and soap_init(). Definition at line 1843 of file stdsoap2.h. Definition at line 1725 of file stdsoap2.h. Referenced by soap_begin(), soap_begin_count(), soap_begin_send(), soap_body_begin_out(), soap_element(), and soap_embed(). Definition at line 1609 of file stdsoap2.h. Referenced by MiriamWebServicesSoapBindingProxy::checkRegExp(), MiriamWebServicesSoapBindingProxy::getDataResources(), MiriamWebServicesSoapBindingProxy::getDataTypeDef(), MiriamWebServicesSoapBindingProxy::getDataTypePattern(), MiriamWebServicesSoapBindingProxy::getDataTypesId(), MiriamWebServicesSoapBindingProxy::getDataTypesName(), MiriamWebServicesSoapBindingProxy::getDataTypeSynonyms(), MiriamWebServicesSoapBindingProxy::getDataTypeURI(), MiriamWebServicesSoapBindingProxy::getDataTypeURIs(), MiriamWebServicesSoapBindingProxy::getJavaLibraryVersion(), MiriamWebServicesSoapBindingProxy::getLocation(), MiriamWebServicesSoapBindingProxy::getLocations(), MiriamWebServicesSoapBindingProxy::getLocations_(), MiriamWebServicesSoapBindingProxy::getMiriamURI(), MiriamWebServicesSoapBindingProxy::getName(), MiriamWebServicesSoapBindingProxy::getNames(), MiriamWebServicesSoapBindingProxy::getOfficialDataTypeURI(), MiriamWebServicesSoapBindingProxy::getResourceInfo(), MiriamWebServicesSoapBindingProxy::getResourceInstitution(), MiriamWebServicesSoapBindingProxy::getResourceLocation(), MiriamWebServicesSoapBindingProxy::getServicesInfo(), MiriamWebServicesSoapBindingProxy::getServicesVersion(), MiriamWebServicesSoapBindingProxy::getURI(), MiriamWebServicesSoapBindingProxy::isDeprecated(), soap_begin_count(), soap_begin_send(), soap_check_result(), soap_element(), soap_element_result(), soap_embedded_id(), soap_free_temp(), soap_init(), soap_is_embedded(), and soap_putindependent(). Definition at line 1734 of file stdsoap2.h. Referenced by http_parse(), http_parse_header(), http_response(), soap_begin(), soap_begin_recv(), soap_end_send(), soap_set_endpoint(), and tcp_connect(). Definition at line 1756 of file stdsoap2.h. Referenced by soap_accept(), soap_bind(), tcp_connect(), tcp_error(), and tcp_init(). Definition at line 1757 of file stdsoap2.h. Referenced by frecv(), fsend(), soap_accept(), soap_bind(), soap_poll(), soap_strerror(), tcp_connect(), tcp_disconnect(), tcp_error(), and tcp_gethost(). Definition at line 1755 of file stdsoap2.h. Referenced by MiriamWebServicesSoapBindingProxy::checkRegExp(), frecv(), MiriamWebServicesSoapBindingProxy::getDataResources(), MiriamWebServicesSoapBindingProxy::getDataTypeDef(), MiriamWebServicesSoapBindingProxy::getDataTypePattern(), MiriamWebServicesSoapBindingProxy::getDataTypesId(), MiriamWebServicesSoapBindingProxy::getDataTypesName(), MiriamWebServicesSoapBindingProxy::getDataTypeSynonyms(), MiriamWebServicesSoapBindingProxy::getDataTypeURI(), MiriamWebServicesSoapBindingProxy::getDataTypeURIs(), MiriamWebServicesSoapBindingProxy::getJavaLibraryVersion(), MiriamWebServicesSoapBindingProxy::getLocation(), MiriamWebServicesSoapBindingProxy::getLocations(), MiriamWebServicesSoapBindingProxy::getLocations_(), MiriamWebServicesSoapBindingProxy::getMiriamURI(), MiriamWebServicesSoapBindingProxy::getName(), MiriamWebServicesSoapBindingProxy::getNames(), MiriamWebServicesSoapBindingProxy::getOfficialDataTypeURI(), MiriamWebServicesSoapBindingProxy::getResourceInfo(), MiriamWebServicesSoapBindingProxy::getResourceInstitution(), MiriamWebServicesSoapBindingProxy::getResourceLocation(), MiriamWebServicesSoapBindingProxy::getServicesInfo(), MiriamWebServicesSoapBindingProxy::getServicesVersion(), MiriamWebServicesSoapBindingProxy::getURI(), http_parse(), http_parse_header(), http_post(), http_post_header(), http_response(), http_send_header(), MiriamWebServicesSoapBindingProxy::isDeprecated(), soap_accept(), soap_append_lab(), soap_array_begin_out(), soap_attachment(), soap_attr_value(), soap_attribute(), soap_base642s(), soap_begin(), soap_begin_count(), soap_begin_recv(), soap_begin_send(), soap_body_begin_in(), soap_body_begin_out(), soap_body_end_out(), soap_closesock(), soap_connect_command(), soap_copy_context(), soap_current_namespace(), soap_dealloc(), soap_dime_forward(), soap_element(), soap_element_begin_in(), soap_element_begin_out(), soap_element_end_in(), soap_element_end_out(), soap_element_href(), soap_element_null(), soap_element_result(), soap_element_start_end_out(), soap_end_count(), soap_end_recv(), soap_end_send(), soap_envelope_begin_in(), soap_envelope_begin_out(), soap_envelope_end_out(), soap_flush(), soap_flush_raw(), soap_get_mime_attachment(), soap_getattrval(), soap_getbase64(), soap_getdime(), soap_getdimefield(), soap_getdimehdr(), soap_getelement(), soap_gethex(), soap_getindependent(), soap_getline(), soap_getmime(), soap_getmimehdr(), soap_hex2s(), soap_id_enter(), soap_id_forward(), soap_id_lookup(), soap_ignore_element(), soap_in_ArrayOf_USCORExsd_USCOREstring(), soap_in_ns2__checkRegExp(), soap_in_ns2__checkRegExpResponse(), soap_in_ns2__getDataResources(), soap_in_ns2__getDataResourcesResponse(), soap_in_ns2__getDataTypeDef(), soap_in_ns2__getDataTypeDefResponse(), soap_in_ns2__getDataTypePattern(), soap_in_ns2__getDataTypePatternResponse(), soap_in_ns2__getDataTypesId(), soap_in_ns2__getDataTypesIdResponse(), soap_in_ns2__getDataTypesName(), soap_in_ns2__getDataTypesNameResponse(), soap_in_ns2__getDataTypeSynonyms(), soap_in_ns2__getDataTypeSynonymsResponse(), soap_in_ns2__getDataTypeURI(), soap_in_ns2__getDataTypeURIResponse(), soap_in_ns2__getDataTypeURIs(), soap_in_ns2__getDataTypeURIsResponse(), soap_in_ns2__getJavaLibraryVersion(), soap_in_ns2__getJavaLibraryVersionResponse(), soap_in_ns2__getLocation(), soap_in_ns2__getLocationResponse(), soap_in_ns2__getLocations(), soap_in_ns2__getLocations_(), soap_in_ns2__getLocationsResponse(), soap_in_ns2__getLocationsResponse_(), soap_in_ns2__getMiriamURI(), soap_in_ns2__getMiriamURIResponse(), soap_in_ns2__getName(), soap_in_ns2__getNameResponse(), soap_in_ns2__getNames(), soap_in_ns2__getNamesResponse(), soap_in_ns2__getOfficialDataTypeURI(), soap_in_ns2__getOfficialDataTypeURIResponse(), soap_in_ns2__getResourceInfo(), soap_in_ns2__getResourceInfoResponse(), soap_in_ns2__getResourceInstitution(), soap_in_ns2__getResourceInstitutionResponse(), soap_in_ns2__getResourceLocation(), soap_in_ns2__getResourceLocationResponse(), soap_in_ns2__getServicesInfo(), soap_in_ns2__getServicesInfoResponse(), soap_in_ns2__getServicesVersion(), soap_in_ns2__getServicesVersionResponse(), soap_in_ns2__getURI(), soap_in_ns2__getURIResponse(), soap_in_ns2__isDeprecated(), soap_in_ns2__isDeprecatedResponse(), soap_in_SOAP_ENV__Code(), soap_in_SOAP_ENV__Detail(), soap_in_SOAP_ENV__Fault(), soap_in_SOAP_ENV__Header(), soap_in_SOAP_ENV__Reason(), soap_inbyte(), soap_indateTime(), soap_inint(), soap_inliteral(), soap_inlong(), soap_inLONG64(), soap_inshort(), soap_instantiate_ArrayOf_USCORExsd_USCOREstring(), soap_instantiate_ns2__checkRegExp(), soap_instantiate_ns2__checkRegExpResponse(), soap_instantiate_ns2__getDataResources(), soap_instantiate_ns2__getDataResourcesResponse(), soap_instantiate_ns2__getDataTypeDef(), soap_instantiate_ns2__getDataTypeDefResponse(), soap_instantiate_ns2__getDataTypePattern(), soap_instantiate_ns2__getDataTypePatternResponse(), soap_instantiate_ns2__getDataTypesId(), soap_instantiate_ns2__getDataTypesIdResponse(), soap_instantiate_ns2__getDataTypesName(), soap_instantiate_ns2__getDataTypesNameResponse(), soap_instantiate_ns2__getDataTypeSynonyms(), soap_instantiate_ns2__getDataTypeSynonymsResponse(), soap_instantiate_ns2__getDataTypeURI(), soap_instantiate_ns2__getDataTypeURIResponse(), soap_instantiate_ns2__getDataTypeURIs(), soap_instantiate_ns2__getDataTypeURIsResponse(), soap_instantiate_ns2__getJavaLibraryVersion(), soap_instantiate_ns2__getJavaLibraryVersionResponse(), soap_instantiate_ns2__getLocation(), soap_instantiate_ns2__getLocationResponse(), soap_instantiate_ns2__getLocations(), soap_instantiate_ns2__getLocations_(), soap_instantiate_ns2__getLocationsResponse(), soap_instantiate_ns2__getLocationsResponse_(), soap_instantiate_ns2__getMiriamURI(), soap_instantiate_ns2__getMiriamURIResponse(), soap_instantiate_ns2__getName(), soap_instantiate_ns2__getNameResponse(), soap_instantiate_ns2__getNames(), soap_instantiate_ns2__getNamesResponse(), soap_instantiate_ns2__getOfficialDataTypeURI(), soap_instantiate_ns2__getOfficialDataTypeURIResponse(), soap_instantiate_ns2__getResourceInfo(), soap_instantiate_ns2__getResourceInfoResponse(), soap_instantiate_ns2__getResourceInstitution(), soap_instantiate_ns2__getResourceInstitutionResponse(), soap_instantiate_ns2__getResourceLocation(), soap_instantiate_ns2__getResourceLocationResponse(), soap_instantiate_ns2__getServicesInfo(), soap_instantiate_ns2__getServicesInfoResponse(), soap_instantiate_ns2__getServicesVersion(), soap_instantiate_ns2__getServicesVersionResponse(), soap_instantiate_ns2__getURI(), soap_instantiate_ns2__getURIResponse(), soap_instantiate_ns2__isDeprecated(), soap_instantiate_ns2__isDeprecatedResponse(), soap_instantiate_SOAP_ENV__Code(), soap_instantiate_SOAP_ENV__Detail(), soap_instantiate_SOAP_ENV__Fault(), soap_instantiate_SOAP_ENV__Header(), soap_instantiate_SOAP_ENV__Reason(), soap_instantiate_std__string(), soap_instring(), soap_inULONG64(), soap_inunsignedByte(), soap_inunsignedInt(), soap_inunsignedLong(), soap_inunsignedShort(), soap_inwliteral(), soap_inwstring(), soap_isnumeric(), soap_malloc(), soap_match_namespace(), soap_new_block(), soap_out_ArrayOf_USCORExsd_USCOREstring(), soap_out_ns2__checkRegExp(), soap_out_ns2__checkRegExpResponse(), soap_out_ns2__getDataResources(), soap_out_ns2__getDataResourcesResponse(), soap_out_ns2__getDataTypeDef(), soap_out_ns2__getDataTypeDefResponse(), soap_out_ns2__getDataTypePattern(), soap_out_ns2__getDataTypePatternResponse(), soap_out_ns2__getDataTypesId(), soap_out_ns2__getDataTypesIdResponse(), soap_out_ns2__getDataTypesName(), soap_out_ns2__getDataTypesNameResponse(), soap_out_ns2__getDataTypeSynonyms(), soap_out_ns2__getDataTypeSynonymsResponse(), soap_out_ns2__getDataTypeURI(), soap_out_ns2__getDataTypeURIResponse(), soap_out_ns2__getDataTypeURIs(), soap_out_ns2__getDataTypeURIsResponse(), soap_out_ns2__getJavaLibraryVersion(), soap_out_ns2__getJavaLibraryVersionResponse(), soap_out_ns2__getLocation(), soap_out_ns2__getLocationResponse(), soap_out_ns2__getLocations(), soap_out_ns2__getLocations_(), soap_out_ns2__getLocationsResponse(), soap_out_ns2__getLocationsResponse_(), soap_out_ns2__getMiriamURI(), soap_out_ns2__getMiriamURIResponse(), soap_out_ns2__getName(), soap_out_ns2__getNameResponse(), soap_out_ns2__getNames(), soap_out_ns2__getNamesResponse(), soap_out_ns2__getOfficialDataTypeURI(), soap_out_ns2__getOfficialDataTypeURIResponse(), soap_out_ns2__getResourceInfo(), soap_out_ns2__getResourceInfoResponse(), soap_out_ns2__getResourceInstitution(), soap_out_ns2__getResourceInstitutionResponse(), soap_out_ns2__getResourceLocation(), soap_out_ns2__getResourceLocationResponse(), soap_out_ns2__getServicesInfo(), soap_out_ns2__getServicesInfoResponse(), soap_out_ns2__getServicesVersion(), soap_out_ns2__getServicesVersionResponse(), soap_out_ns2__getURI(), soap_out_ns2__getURIResponse(), soap_out_ns2__isDeprecated(), soap_out_ns2__isDeprecatedResponse(), soap_out_PointerToArrayOf_USCORExsd_USCOREstring(), soap_out_PointerToSOAP_ENV__Code(), soap_out_PointerToSOAP_ENV__Detail(), soap_out_PointerToSOAP_ENV__Reason(), soap_out_PointerTostd__string(), soap_out_SOAP_ENV__Code(), soap_out_SOAP_ENV__Detail(), soap_out_SOAP_ENV__Fault(), soap_out_SOAP_ENV__Header(), soap_out_SOAP_ENV__Reason(), soap_out_std__string(), soap_outbyte(), soap_outdateTime(), soap_outdouble(), soap_outfloat(), soap_outint(), soap_outliteral(), soap_outlong(), soap_outLONG64(), soap_outshort(), soap_outstring(), soap_outULONG64(), soap_outunsignedByte(), soap_outunsignedInt(), soap_outunsignedLong(), soap_outunsignedShort(), soap_outwliteral(), soap_outwstring(), soap_peek_element(), soap_pointer_enter(), soap_poll(), soap_print_fault(), soap_print_fault_location(), soap_push_block(), soap_push_namespace(), soap_push_ns(), ArrayOf_USCORExsd_USCOREstring::soap_put(), soap_put__QName(), soap_put_byte(), soap_put_int(), soap_put_ns2__checkRegExp(), soap_put_ns2__checkRegExpResponse(), soap_put_ns2__getDataResources(), soap_put_ns2__getDataResourcesResponse(), soap_put_ns2__getDataTypeDef(), soap_put_ns2__getDataTypeDefResponse(), soap_put_ns2__getDataTypePattern(), soap_put_ns2__getDataTypePatternResponse(), soap_put_ns2__getDataTypesId(), soap_put_ns2__getDataTypesIdResponse(), soap_put_ns2__getDataTypesName(), soap_put_ns2__getDataTypesNameResponse(), soap_put_ns2__getDataTypeSynonyms(), soap_put_ns2__getDataTypeSynonymsResponse(), soap_put_ns2__getDataTypeURI(), soap_put_ns2__getDataTypeURIResponse(), soap_put_ns2__getDataTypeURIs(), soap_put_ns2__getDataTypeURIsResponse(), soap_put_ns2__getJavaLibraryVersion(), soap_put_ns2__getJavaLibraryVersionResponse(), soap_put_ns2__getLocation(), soap_put_ns2__getLocationResponse(), soap_put_ns2__getLocations(), soap_put_ns2__getLocations_(), soap_put_ns2__getLocationsResponse(), soap_put_ns2__getLocationsResponse_(), soap_put_ns2__getMiriamURI(), soap_put_ns2__getMiriamURIResponse(), soap_put_ns2__getName(), soap_put_ns2__getNameResponse(), soap_put_ns2__getNames(), soap_put_ns2__getNamesResponse(), soap_put_ns2__getOfficialDataTypeURI(), soap_put_ns2__getOfficialDataTypeURIResponse(), soap_put_ns2__getResourceInfo(), soap_put_ns2__getResourceInfoResponse(), soap_put_ns2__getResourceInstitution(), soap_put_ns2__getResourceInstitutionResponse(), soap_put_ns2__getResourceLocation(), soap_put_ns2__getResourceLocationResponse(), soap_put_ns2__getServicesInfo(), soap_put_ns2__getServicesInfoResponse(), soap_put_ns2__getServicesVersion(), soap_put_ns2__getServicesVersionResponse(), soap_put_ns2__getURI(), soap_put_ns2__getURIResponse(), soap_put_ns2__isDeprecated(), soap_put_ns2__isDeprecatedResponse(), soap_put_PointerToArrayOf_USCORExsd_USCOREstring(), soap_put_PointerToSOAP_ENV__Code(), soap_put_PointerToSOAP_ENV__Detail(), soap_put_PointerToSOAP_ENV__Reason(), soap_put_PointerTostd__string(), soap_put_SOAP_ENV__Code(), soap_put_SOAP_ENV__Detail(), soap_put_SOAP_ENV__Fault(), soap_put_SOAP_ENV__Header(), soap_put_SOAP_ENV__Reason(), soap_put_std__string(), soap_put_string(), soap_putbase64(), soap_putdime(), soap_putdimefield(), soap_putdimehdr(), soap_putheader(), soap_puthex(), soap_putindependent(), soap_putmime(), soap_putmimehdr(), soap_recv_empty_response(), soap_recv_fault(), soap_recv_header(), soap_recv_raw(), soap_register_plugin_arg(), soap_resolve(), soap_response(), soap_retry(), soap_s2byte(), soap_s2dateTime(), soap_s2double(), soap_s2float(), soap_s2int(), soap_s2long(), soap_s2LONG64(), soap_s2QName(), soap_s2short(), soap_s2string(), soap_s2ULONG64(), soap_s2unsignedByte(), soap_s2unsignedInt(), soap_s2unsignedLong(), soap_s2unsignedShort(), soap_s2wchar(), soap_save_block(), soap_send2(), soap_send3(), soap_send_fault(), soap_send_raw(), soap_set_attr(), soap_set_error(), soap_set_fault(), soap_set_namespaces(), soap_sprint_fault(), soap_string_in(), soap_string_out(), soap_try_connect_command(), soap_wstring_in(), soap_wstring_out(), soap_xop_forward(), and tcp_connect(). Definition at line 1655 of file stdsoap2.h. Referenced by soap_accept(), soap_done(), and soap_init(). Definition at line 1632 of file stdsoap2.h. Referenced by soap_begin_recv(), soap_copy_context(), soap_dealloc(), soap_delete(), MiriamWebServicesSoapBindingProxy::soap_fault(), soap_fault(), soap_faultcode(), soap_faultdetail(), soap_faultstring(), soap_faultsubcode(), soap_getfault(), soap_init(), soap_putfault(), and soap_serializefault(). Definition at line 1656 of file stdsoap2.h. Referenced by soap_closesock(), soap_done(), and soap_init(). Definition at line 1652 of file stdsoap2.h. Referenced by soap_bind(), soap_done(), soap_init(), tcp_connect(), and tcp_disconnect(). Definition at line 1650 of file stdsoap2.h. Referenced by soap_init(), and soap_try_connect_command(). Definition at line 1766 of file stdsoap2.h. Referenced by soap_init_logs(), and soap_open_logfile(). Definition at line 1641 of file stdsoap2.h. Referenced by http_parse(), soap_done(), and soap_init(). Definition at line 1674 of file stdsoap2.h. Referenced by soap_init(), and soap_putdime(). Definition at line 1672 of file stdsoap2.h. Definition at line 1670 of file stdsoap2.h. Definition at line 1675 of file stdsoap2.h. Referenced by soap_getdime(), and soap_init(). Definition at line 1673 of file stdsoap2.h. Definition at line 1671 of file stdsoap2.h. Definition at line 1651 of file stdsoap2.h. Referenced by soap_end_recv(), and soap_init(). Definition at line 1643 of file stdsoap2.h. Referenced by soap_begin_recv(), soap_done(), and soap_init(). Definition at line 1639 of file stdsoap2.h. Definition at line 1642 of file stdsoap2.h. Definition at line 1648 of file stdsoap2.h. Referenced by soap_done(), soap_init(), and soap_recv_header(). Definition at line 1661 of file stdsoap2.h. Referenced by soap_done(), soap_ignore_element(), and soap_init(). Definition at line 1604 of file stdsoap2.h. Referenced by soap_float2s(), and soap_init(). Definition at line 1664 of file stdsoap2.h. Referenced by soap_done(), soap_init(), and soap_malloc(). Definition at line 1680 of file stdsoap2.h. Referenced by soap_init(), soap_putmime(), and soap_valid_mime_boundary(). Definition at line 1678 of file stdsoap2.h. Referenced by soap_init(), and soap_putmime(). Definition at line 1676 of file stdsoap2.h. Definition at line 1681 of file stdsoap2.h. 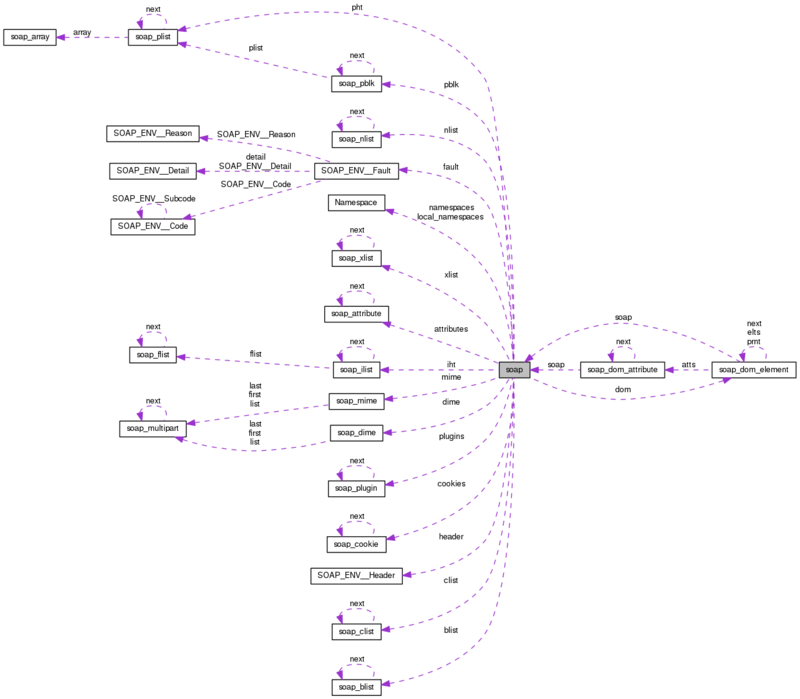 Referenced by soap_get_mime_attachment(), and soap_init(). Definition at line 1679 of file stdsoap2.h. Definition at line 1677 of file stdsoap2.h. Definition at line 1654 of file stdsoap2.h. Referenced by soap_done(), soap_init(), and soap_try_connect_command(). Definition at line 1646 of file stdsoap2.h. Referenced by soap_begin_recv(), soap_done(), soap_init(), and tcp_connect(). Definition at line 1647 of file stdsoap2.h. Definition at line 1663 of file stdsoap2.h. Referenced by soap_done(), soap_init(), and soap_lookup_plugin(). Definition at line 1659 of file stdsoap2.h. Referenced by soap_done(), soap_init(), soap_send_fault(), and soap_try_connect_command(). Definition at line 1638 of file stdsoap2.h. Referenced by soap_done(), soap_end_send(), soap_init(), and soap_try_connect_command(). Definition at line 1644 of file stdsoap2.h. Referenced by http_parse_header(), http_post(), http_response(), soap_done(), soap_init(), soap_puthttphdr(), and tcp_connect(). Definition at line 1669 of file stdsoap2.h. Referenced by soap_done(), soap_end_count(), and soap_init(). Definition at line 1666 of file stdsoap2.h. Referenced by soap_begin_count(), soap_begin_recv(), soap_begin_send(), soap_done(), and soap_init(). Definition at line 1668 of file stdsoap2.h. Referenced by soap_begin_recv(), soap_done(), soap_init(), and soap_recv_raw(). Definition at line 1667 of file stdsoap2.h. Referenced by soap_begin_count(), soap_done(), soap_flush_raw(), soap_init(), and soap_send_raw(). Definition at line 1640 of file stdsoap2.h. Definition at line 1658 of file stdsoap2.h. Referenced by soap_done(), soap_getchunkchar(), soap_init(), and soap_recv_raw(). Definition at line 1649 of file stdsoap2.h. Referenced by soap_bind(), soap_done(), soap_init(), and tcp_connect(). Definition at line 1645 of file stdsoap2.h. Referenced by soap_done(), soap_end_send(), soap_init(), and soap_response(). Definition at line 1657 of file stdsoap2.h. Referenced by soap_done(), soap_end_send(), soap_flush_raw(), and soap_init(). Definition at line 1662 of file stdsoap2.h. Definition at line 1660 of file stdsoap2.h. Referenced by soap_done(), soap_init(), and soap_set_fault(). Definition at line 1653 of file stdsoap2.h. Referenced by soap_done(), soap_end_send(), soap_init(), and tcp_disconnect(). Definition at line 1796 of file stdsoap2.h. Definition at line 1797 of file stdsoap2.h. Definition at line 1631 of file stdsoap2.h. Referenced by soap_begin_recv(), soap_copy_context(), soap_dealloc(), soap_delete(), soap_getheader(), soap_header(), soap_init(), MiriamWebServicesSoapBindingProxy::soap_noheader(), soap_putheader(), and soap_serializeheader(). Definition at line 1736 of file stdsoap2.h. Referenced by soap_accept(), soap_end_send(), soap_init(), soap_set_endpoint(), soap_try_connect_command(), and tcp_disconnect(). Definition at line 1715 of file stdsoap2.h. Referenced by soap_dime_forward(), soap_element_ref(), soap_getelement(), soap_in_ArrayOf_USCORExsd_USCOREstring(), soap_in_ns2__checkRegExp(), soap_in_ns2__checkRegExpResponse(), soap_in_ns2__getDataResources(), soap_in_ns2__getDataResourcesResponse(), soap_in_ns2__getDataTypeDef(), soap_in_ns2__getDataTypeDefResponse(), soap_in_ns2__getDataTypePattern(), soap_in_ns2__getDataTypePatternResponse(), soap_in_ns2__getDataTypesId(), soap_in_ns2__getDataTypesIdResponse(), soap_in_ns2__getDataTypesName(), soap_in_ns2__getDataTypesNameResponse(), soap_in_ns2__getDataTypeSynonyms(), soap_in_ns2__getDataTypeSynonymsResponse(), soap_in_ns2__getDataTypeURI(), soap_in_ns2__getDataTypeURIResponse(), soap_in_ns2__getDataTypeURIs(), soap_in_ns2__getDataTypeURIsResponse(), soap_in_ns2__getJavaLibraryVersion(), soap_in_ns2__getJavaLibraryVersionResponse(), soap_in_ns2__getLocation(), soap_in_ns2__getLocationResponse(), soap_in_ns2__getLocations(), soap_in_ns2__getLocations_(), soap_in_ns2__getLocationsResponse(), soap_in_ns2__getLocationsResponse_(), soap_in_ns2__getMiriamURI(), soap_in_ns2__getMiriamURIResponse(), soap_in_ns2__getName(), soap_in_ns2__getNameResponse(), soap_in_ns2__getNames(), soap_in_ns2__getNamesResponse(), soap_in_ns2__getOfficialDataTypeURI(), soap_in_ns2__getOfficialDataTypeURIResponse(), soap_in_ns2__getResourceInfo(), soap_in_ns2__getResourceInfoResponse(), soap_in_ns2__getResourceInstitution(), soap_in_ns2__getResourceInstitutionResponse(), soap_in_ns2__getResourceLocation(), soap_in_ns2__getResourceLocationResponse(), soap_in_ns2__getServicesInfo(), soap_in_ns2__getServicesInfoResponse(), soap_in_ns2__getServicesVersion(), soap_in_ns2__getServicesVersionResponse(), soap_in_ns2__getURI(), soap_in_ns2__getURIResponse(), soap_in_ns2__isDeprecated(), soap_in_ns2__isDeprecatedResponse(), soap_in_PointerToArrayOf_USCORExsd_USCOREstring(), soap_in_PointerToSOAP_ENV__Code(), soap_in_PointerToSOAP_ENV__Detail(), soap_in_PointerToSOAP_ENV__Reason(), soap_in_PointerTostd__string(), soap_in_SOAP_ENV__Code(), soap_in_SOAP_ENV__Detail(), soap_in_SOAP_ENV__Fault(), soap_in_SOAP_ENV__Header(), soap_in_SOAP_ENV__Reason(), soap_in_std__string(), soap_inbyte(), soap_indateTime(), soap_indouble(), soap_infloat(), soap_inint(), soap_inlong(), soap_inLONG64(), soap_inshort(), soap_instring(), soap_inULONG64(), soap_inunsignedByte(), soap_inunsignedInt(), soap_inunsignedLong(), soap_inunsignedShort(), soap_inwstring(), soap_peek_element(), and soap_xop_forward(). Definition at line 1608 of file stdsoap2.h. Referenced by http_parse(), http_parse_header(), soap_dealloc(), soap_init(), and soap_puthttphdr(). Definition at line 1607 of file stdsoap2.h. Referenced by http_post(), http_response(), and soap_init(). Definition at line 1714 of file stdsoap2.h. Referenced by soap_envelope_end_out(), soap_getelement(), soap_id_enter(), soap_id_forward(), soap_id_lookup(), soap_ignore_element(), soap_in_ArrayOf_USCORExsd_USCOREstring(), soap_in_ns2__checkRegExp(), soap_in_ns2__checkRegExpResponse(), soap_in_ns2__getDataResources(), soap_in_ns2__getDataResourcesResponse(), soap_in_ns2__getDataTypeDef(), soap_in_ns2__getDataTypeDefResponse(), soap_in_ns2__getDataTypePattern(), soap_in_ns2__getDataTypePatternResponse(), soap_in_ns2__getDataTypesId(), soap_in_ns2__getDataTypesIdResponse(), soap_in_ns2__getDataTypesName(), soap_in_ns2__getDataTypesNameResponse(), soap_in_ns2__getDataTypeSynonyms(), soap_in_ns2__getDataTypeSynonymsResponse(), soap_in_ns2__getDataTypeURI(), soap_in_ns2__getDataTypeURIResponse(), soap_in_ns2__getDataTypeURIs(), soap_in_ns2__getDataTypeURIsResponse(), soap_in_ns2__getJavaLibraryVersion(), soap_in_ns2__getJavaLibraryVersionResponse(), soap_in_ns2__getLocation(), soap_in_ns2__getLocationResponse(), soap_in_ns2__getLocations(), soap_in_ns2__getLocations_(), soap_in_ns2__getLocationsResponse(), soap_in_ns2__getLocationsResponse_(), soap_in_ns2__getMiriamURI(), soap_in_ns2__getMiriamURIResponse(), soap_in_ns2__getName(), soap_in_ns2__getNameResponse(), soap_in_ns2__getNames(), soap_in_ns2__getNamesResponse(), soap_in_ns2__getOfficialDataTypeURI(), soap_in_ns2__getOfficialDataTypeURIResponse(), soap_in_ns2__getResourceInfo(), soap_in_ns2__getResourceInfoResponse(), soap_in_ns2__getResourceInstitution(), soap_in_ns2__getResourceInstitutionResponse(), soap_in_ns2__getResourceLocation(), soap_in_ns2__getResourceLocationResponse(), soap_in_ns2__getServicesInfo(), soap_in_ns2__getServicesInfoResponse(), soap_in_ns2__getServicesVersion(), soap_in_ns2__getServicesVersionResponse(), soap_in_ns2__getURI(), soap_in_ns2__getURIResponse(), soap_in_ns2__isDeprecated(), soap_in_ns2__isDeprecatedResponse(), soap_in_SOAP_ENV__Code(), soap_in_SOAP_ENV__Detail(), soap_in_SOAP_ENV__Fault(), soap_in_SOAP_ENV__Header(), soap_in_SOAP_ENV__Reason(), soap_in_std__string(), soap_inbyte(), soap_indateTime(), soap_indouble(), soap_infloat(), soap_inint(), soap_inlong(), soap_inLONG64(), soap_inshort(), soap_instring(), soap_inULONG64(), soap_inunsignedByte(), soap_inunsignedInt(), soap_inunsignedLong(), soap_inunsignedShort(), soap_inwstring(), soap_peek_element(), soap_resolve(), soap_set_attr(), and soap_set_fault(). Definition at line 1633 of file stdsoap2.h. Referenced by soap_begin(), soap_begin_count(), soap_begin_send(), soap_pointer_enter(), and soap_QName2s(). Definition at line 1627 of file stdsoap2.h. Referenced by soap_enter(), soap_free_iht(), soap_has_copies(), soap_init_iht(), soap_lookup(), soap_resolve(), and soap_update_ptrs(). Definition at line 1602 of file stdsoap2.h. Referenced by http_parse(), http_parse_header(), MiriamWebServicesSoapBindingProxy::MiriamWebServicesSoapBindingProxy(), soap_accept(), soap_begin(), soap_begin_recv(), soap_bind(), soap_copy_stream(), soap_poll(), soap_post_check_mime_attachments(), and tcp_connect(). Definition at line 1740 of file stdsoap2.h. Referenced by frecv(), soap_accept(), and soap_init(). Definition at line 1779 of file stdsoap2.h. Definition at line 1780 of file stdsoap2.h. Definition at line 1778 of file stdsoap2.h. Definition at line 1690 of file stdsoap2.h. Referenced by frecv(), soap_copy_stream(), and soap_init(). Definition at line 1742 of file stdsoap2.h. Referenced by http_parse(), http_parse_header(), soap_accept(), soap_begin(), soap_begin_recv(), soap_begin_send(), soap_closesock(), soap_copy_stream(), soap_done(), soap_end_send(), soap_init(), soap_puthttphdr(), soap_send_fault(), soap_try_connect_command(), and tcp_connect(). Definition at line 1804 of file stdsoap2.h. Definition at line 1707 of file stdsoap2.h. Referenced by soap_append_lab(), soap_copy_context(), soap_free_temp(), soap_get_http_body(), soap_getbase64(), soap_gethex(), soap_init(), soap_peek_element(), soap_QName2s(), soap_s2QName(), and soap_string_in(). Definition at line 1709 of file stdsoap2.h. Referenced by soap_append_lab(), soap_copy_context(), soap_free_temp(), soap_get_http_body(), soap_getbase64(), soap_gethex(), soap_init(), soap_peek_element(), soap_QName2s(), soap_s2QName(), soap_store_lab(), and soap_string_in(). Definition at line 1708 of file stdsoap2.h. Referenced by soap_append_lab(), soap_copy_context(), soap_free_temp(), soap_get_http_body(), soap_getbase64(), soap_gethex(), soap_init(), soap_peek_element(), and soap_string_in(). Definition at line 1611 of file stdsoap2.h. Referenced by soap_init(), and soap_out_SOAP_ENV__Reason(). Definition at line 1706 of file stdsoap2.h. Referenced by http_parse(), http_parse_header(), soap_begin(), soap_begin_recv(), and soap_get_http_body(). Definition at line 1704 of file stdsoap2.h. Referenced by MiriamWebServicesSoapBindingProxy::checkRegExp(), MiriamWebServicesSoapBindingProxy::getDataResources(), MiriamWebServicesSoapBindingProxy::getDataTypeDef(), MiriamWebServicesSoapBindingProxy::getDataTypePattern(), MiriamWebServicesSoapBindingProxy::getDataTypesId(), MiriamWebServicesSoapBindingProxy::getDataTypesName(), MiriamWebServicesSoapBindingProxy::getDataTypeSynonyms(), MiriamWebServicesSoapBindingProxy::getDataTypeURI(), MiriamWebServicesSoapBindingProxy::getDataTypeURIs(), MiriamWebServicesSoapBindingProxy::getJavaLibraryVersion(), MiriamWebServicesSoapBindingProxy::getLocation(), MiriamWebServicesSoapBindingProxy::getLocations(), MiriamWebServicesSoapBindingProxy::getLocations_(), MiriamWebServicesSoapBindingProxy::getMiriamURI(), MiriamWebServicesSoapBindingProxy::getName(), MiriamWebServicesSoapBindingProxy::getNames(), MiriamWebServicesSoapBindingProxy::getOfficialDataTypeURI(), MiriamWebServicesSoapBindingProxy::getResourceInfo(), MiriamWebServicesSoapBindingProxy::getResourceInstitution(), MiriamWebServicesSoapBindingProxy::getResourceLocation(), MiriamWebServicesSoapBindingProxy::getServicesInfo(), MiriamWebServicesSoapBindingProxy::getServicesVersion(), MiriamWebServicesSoapBindingProxy::getURI(), MiriamWebServicesSoapBindingProxy::isDeprecated(), soap_begin(), soap_begin_recv(), soap_begin_send(), soap_element(), soap_element_begin_in(), soap_element_end_in(), soap_element_end_out(), soap_element_start_end_out(), soap_ignore_element(), soap_pop_namespace(), soap_push_namespace(), soap_push_ns(), soap_revert(), and soap_set_namespaces(). Definition at line 1620 of file stdsoap2.h. Referenced by soap_accept(), soap_init(), and tcp_connect(). Definition at line 1622 of file stdsoap2.h. Referenced by soap_copy_context(), soap_element(), soap_envelope_begin_in(), soap_envelope_end_out(), soap_free_temp(), soap_init(), soap_match_namespace(), soap_outliteral(), soap_outwliteral(), soap_push_namespace(), soap_QName2s(), soap_s2QName(), soap_set_local_namespaces(), and soap_set_namespaces(). Definition at line 1765 of file stdsoap2.h. Referenced by soap_copy_context(), soap_done(), soap_init_logs(), and soap_open_logfile(). Definition at line 1683 of file stdsoap2.h. Referenced by http_response(), soap_accept(), soap_bind(), soap_done(), soap_init(), and soap_poll(). Definition at line 1747 of file stdsoap2.h. Referenced by soap_copy_stream(), and soap_init(). Definition at line 1767 of file stdsoap2.h. Definition at line 1761 of file stdsoap2.h. Referenced by http_parse_header(), soap_attachment(), soap_begin_recv(), soap_clr_mime(), soap_count_attachments(), soap_end_recv(), soap_end_send(), soap_envelope_begin_out(), soap_get_mime_attachment(), soap_getmimehdr(), soap_init(), soap_puthttphdr(), soap_putmime(), soap_putmimehdr(), soap_select_mime_boundary(), soap_set_mime(), soap_set_mime_attachment(), and soap_valid_mime_boundary(). Definition at line 1601 of file stdsoap2.h. Referenced by MiriamWebServicesSoapBindingProxy::checkRegExp(), MiriamWebServicesSoapBindingProxy::getDataResources(), MiriamWebServicesSoapBindingProxy::getDataTypeDef(), MiriamWebServicesSoapBindingProxy::getDataTypePattern(), MiriamWebServicesSoapBindingProxy::getDataTypesId(), MiriamWebServicesSoapBindingProxy::getDataTypesName(), MiriamWebServicesSoapBindingProxy::getDataTypeSynonyms(), MiriamWebServicesSoapBindingProxy::getDataTypeURI(), MiriamWebServicesSoapBindingProxy::getDataTypeURIs(), MiriamWebServicesSoapBindingProxy::getJavaLibraryVersion(), MiriamWebServicesSoapBindingProxy::getLocation(), MiriamWebServicesSoapBindingProxy::getLocations(), MiriamWebServicesSoapBindingProxy::getLocations_(), MiriamWebServicesSoapBindingProxy::getMiriamURI(), MiriamWebServicesSoapBindingProxy::getName(), MiriamWebServicesSoapBindingProxy::getNames(), MiriamWebServicesSoapBindingProxy::getOfficialDataTypeURI(), MiriamWebServicesSoapBindingProxy::getResourceInfo(), MiriamWebServicesSoapBindingProxy::getResourceInstitution(), MiriamWebServicesSoapBindingProxy::getResourceLocation(), MiriamWebServicesSoapBindingProxy::getServicesInfo(), MiriamWebServicesSoapBindingProxy::getServicesVersion(), MiriamWebServicesSoapBindingProxy::getURI(), MiriamWebServicesSoapBindingProxy::isDeprecated(), soap_array_begin_out(), soap_attachment(), soap_attr_value(), soap_attribute(), soap_begin(), soap_begin_count(), soap_begin_recv(), soap_begin_send(), soap_body_begin_out(), soap_check_mime_attachments(), soap_clr_attr(), soap_copy_stream(), soap_count_attachments(), soap_element(), soap_element_begin_in(), soap_element_end_in(), soap_element_end_out(), soap_element_id(), soap_element_null(), soap_element_start_end_out(), soap_embedded_id(), soap_end_recv(), soap_end_send(), soap_envelope_begin_out(), soap_envelope_end_out(), soap_flush(), soap_flush_raw(), soap_get_http_body(), soap_get_mime_attachment(), soap_get_pi(), soap_getbase64(), soap_getdimehdr(), soap_gethex(), soap_getutf8(), soap_ignore_element(), soap_in_ns2__checkRegExp(), soap_in_ns2__checkRegExpResponse(), soap_in_ns2__getDataResources(), soap_in_ns2__getDataTypeDef(), soap_in_ns2__getDataTypeDefResponse(), soap_in_ns2__getDataTypePattern(), soap_in_ns2__getDataTypePatternResponse(), soap_in_ns2__getDataTypeSynonyms(), soap_in_ns2__getDataTypeURI(), soap_in_ns2__getDataTypeURIResponse(), soap_in_ns2__getDataTypeURIs(), soap_in_ns2__getJavaLibraryVersionResponse(), soap_in_ns2__getLocation(), soap_in_ns2__getLocationResponse(), soap_in_ns2__getLocations(), soap_in_ns2__getLocations_(), soap_in_ns2__getMiriamURI(), soap_in_ns2__getMiriamURIResponse(), soap_in_ns2__getName(), soap_in_ns2__getNameResponse(), soap_in_ns2__getNames(), soap_in_ns2__getOfficialDataTypeURI(), soap_in_ns2__getOfficialDataTypeURIResponse(), soap_in_ns2__getResourceInfo(), soap_in_ns2__getResourceInfoResponse(), soap_in_ns2__getResourceInstitution(), soap_in_ns2__getResourceInstitutionResponse(), soap_in_ns2__getResourceLocation(), soap_in_ns2__getResourceLocationResponse(), soap_in_ns2__getServicesInfoResponse(), soap_in_ns2__getServicesVersionResponse(), soap_in_ns2__getURI(), soap_in_ns2__getURIResponse(), soap_in_ns2__isDeprecated(), soap_in_ns2__isDeprecatedResponse(), soap_is_embedded(), soap_is_single(), soap_out_std__string(), soap_outstring(), soap_outwstring(), soap_peek_element(), soap_putbase64(), soap_putdime(), soap_puthex(), soap_puthttphdr(), soap_putindependent(), soap_putmime(), soap_QName2s(), soap_recv(), soap_recv_raw(), soap_reference(), soap_response(), soap_s2int(), soap_s2long(), soap_s2LONG64(), soap_s2string(), soap_s2ULONG64(), soap_s2unsignedInt(), soap_s2unsignedLong(), soap_s2wchar(), soap_send_fault(), soap_send_raw(), soap_set_attr(), soap_set_embedded(), soap_string_in(), soap_string_out(), soap_try_connect_command(), soap_value(), soap_wstring_in(), and soap_wstring_out(). Definition at line 1711 of file stdsoap2.h. Referenced by http_parse(), soap_get_mime_attachment(), soap_getmimehdr(), soap_set_fault(), soap_set_validation_fault(), soap_strerror(), and tcp_error(). Definition at line 1726 of file stdsoap2.h. Referenced by soap_begin(), soap_begin_count(), soap_begin_send(), soap_element(), soap_element_null(), soap_ignore_element(), and soap_peek_element(). Definition at line 1621 of file stdsoap2.h. Referenced by MiriamWebServicesSoapBindingProxy::MiriamWebServicesSoapBindingProxy_init(), soap_current_namespace(), soap_init(), soap_set_local_namespaces(), and soap_set_namespaces(). Definition at line 1623 of file stdsoap2.h. Referenced by soap_copy_context(), soap_current_namespace(), soap_element(), soap_element_start_end_out(), soap_free_ns(), soap_init(), soap_lookup_ns(), soap_match_namespace(), soap_pop_namespace(), soap_push_namespace(), soap_push_ns(), soap_s2QName(), and soap_set_namespaces(). Definition at line 1728 of file stdsoap2.h. Referenced by soap_begin(), soap_begin_count(), soap_begin_send(), and soap_element(). Definition at line 1727 of file stdsoap2.h. Referenced by soap_begin(), soap_begin_count(), soap_begin_send(), soap_element(), soap_element_begin_in(), soap_element_null(), soap_in_PointerToArrayOf_USCORExsd_USCOREstring(), soap_in_PointerToSOAP_ENV__Code(), soap_in_PointerToSOAP_ENV__Detail(), soap_in_PointerToSOAP_ENV__Reason(), soap_in_PointerTostd__string(), soap_in_std__string(), soap_inliteral(), soap_instring(), soap_inwliteral(), soap_inwstring(), and soap_peek_element(). Definition at line 1603 of file stdsoap2.h. Referenced by frecv(), fsend(), http_parse(), http_response(), MiriamWebServicesSoapBindingProxy::MiriamWebServicesSoapBindingProxy(), soap_accept(), soap_begin(), soap_begin_count(), soap_begin_recv(), soap_begin_send(), soap_bind(), soap_clr_dime(), soap_clr_mime(), soap_copy_stream(), soap_done(), soap_end_send(), soap_puthttphdr(), soap_response(), soap_send_empty_response(), soap_set_dime(), soap_set_mime(), soap_try_connect_command(), tcp_connect(), and tcp_disconnect(). Definition at line 1689 of file stdsoap2.h. Referenced by fsend(), soap_copy_stream(), and soap_init(). Definition at line 1720 of file stdsoap2.h. Referenced by soap_element_begin_in(), soap_ignore_element(), and soap_peek_element(). Definition at line 1729 of file stdsoap2.h. Referenced by soap_begin(), soap_begin_count(), soap_begin_recv(), soap_begin_send(), soap_body_begin_in(), soap_body_begin_out(), soap_body_end_in(), soap_body_end_out(), soap_element(), soap_embedded_id(), soap_end_recv(), soap_end_send(), soap_envelope_begin_in(), soap_envelope_begin_out(), soap_envelope_end_in(), soap_envelope_end_out(), soap_getheader(), soap_ignore_element(), soap_is_embedded(), soap_is_single(), soap_putheader(), and soap_set_attr(). Definition at line 1637 of file stdsoap2.h. Referenced by http_parse(), http_parse_header(), http_post(), soap_copy_context(), soap_dealloc(), soap_init(), and tcp_connect(). Definition at line 1805 of file stdsoap2.h. Definition at line 1735 of file stdsoap2.h. Referenced by http_parse(), soap_end_send(), soap_set_endpoint(), and soap_try_connect_command(). Definition at line 1629 of file stdsoap2.h. Referenced by soap_free_pht(), soap_init_pht(), and soap_pointer_enter(). Definition at line 1731 of file stdsoap2.h. Referenced by soap_begin(), soap_begin_recv(), soap_element_begin_in(), soap_element_end_in(), soap_ignore_element(), soap_peek_element(), soap_revert(), soap_string_in(), and soap_wstring_in(). Definition at line 1784 of file stdsoap2.h. Referenced by frecv(), fsend(), soap_accept(), soap_bind(), soap_copy_stream(), and tcp_connect(). Definition at line 1787 of file stdsoap2.h. Definition at line 1628 of file stdsoap2.h. Referenced by soap_array_pointer_lookup(), soap_free_pht(), soap_init_pht(), soap_pointer_enter(), soap_pointer_lookup(), and soap_putindependent(). Definition at line 1630 of file stdsoap2.h. Definition at line 1635 of file stdsoap2.h. Referenced by fplugin(), soap_copy_context(), soap_done(), soap_init(), and soap_register_plugin_arg(). Definition at line 1741 of file stdsoap2.h. Referenced by http_post(), soap_accept(), soap_end_send(), soap_init(), soap_set_endpoint(), soap_try_connect_command(), and tcp_disconnect(). Definition at line 1721 of file stdsoap2.h. Referenced by soap_begin(), soap_begin_count(), soap_begin_send(), soap_element(), soap_element_null(), soap_in_ArrayOf_USCORExsd_USCOREstring(), soap_out_ArrayOf_USCORExsd_USCOREstring(), and soap_peek_element(). Definition at line 1722 of file stdsoap2.h. Referenced by soap_element(), soap_in_ArrayOf_USCORExsd_USCOREstring(), soap_out_ArrayOf_USCORExsd_USCOREstring(), and soap_peek_element(). Definition at line 1739 of file stdsoap2.h. Referenced by soap_element(), and soap_init(). Definition at line 1753 of file stdsoap2.h. Referenced by http_parse(), and http_parse_header(). Definition at line 1749 of file stdsoap2.h. Referenced by http_post(), soap_init(), and tcp_connect(). Definition at line 1748 of file stdsoap2.h. Definition at line 1752 of file stdsoap2.h. Definition at line 1750 of file stdsoap2.h. Definition at line 1751 of file stdsoap2.h. Definition at line 1810 of file stdsoap2.h. Definition at line 1612 of file stdsoap2.h. Referenced by frecv(), soap_accept(), soap_copy_stream(), soap_init(), soap_send_fault(), soap_strerror(), and tcp_connect(). Definition at line 1694 of file stdsoap2.h. Referenced by frecv(), soap_begin_recv(), soap_copy_stream(), and soap_init(). Definition at line 1723 of file stdsoap2.h. Definition at line 1613 of file stdsoap2.h. Referenced by fsend(), soap_accept(), soap_copy_stream(), soap_init(), soap_send_fault(), soap_strerror(), and tcp_connect(). Definition at line 1693 of file stdsoap2.h. Referenced by fsend(), soap_begin_send(), soap_copy_stream(), and soap_init(). Definition at line 1801 of file stdsoap2.h. Referenced by soap_done(), soap_init(), tcp_connect(), and tcp_disconnect(). Definition at line 1811 of file stdsoap2.h. Referenced by tcp_connect(), and tcp_disconnect(). Definition at line 1812 of file stdsoap2.h. Definition at line 1684 of file stdsoap2.h. Referenced by frecv(), fsend(), http_response(), soap_accept(), soap_begin_count(), soap_begin_recv(), soap_begin_send(), soap_bind(), soap_copy_stream(), soap_end_send(), soap_getchunkchar(), soap_init(), soap_poll(), soap_recv_raw(), soap_send_fault(), soap_try_connect_command(), tcp_connect(), and tcp_disconnect(). Definition at line 1616 of file stdsoap2.h. Referenced by frecv(), fsend(), and soap_init(). Definition at line 1799 of file stdsoap2.h. Referenced by frecv(), fsend(), http_post(), soap_begin_recv(), soap_begin_send(), soap_copy_context(), soap_copy_stream(), soap_done(), soap_end_send(), soap_init(), soap_poll(), tcp_connect(), and tcp_disconnect(). Definition at line 1803 of file stdsoap2.h. Definition at line 1599 of file stdsoap2.h. Referenced by soap_copy_context(), soap_done(), and soap_init(). Definition at line 1754 of file stdsoap2.h. Referenced by http_parse(), http_post(), soap_begin_recv(), soap_end_send(), soap_envelope_begin_in(), soap_puthttphdr(), soap_response(), and soap_try_connect_command(). Definition at line 1713 of file stdsoap2.h. Referenced by soap_element_begin_in(), soap_element_end_in(), soap_getelement(), soap_ignore_element(), soap_peek_element(), soap_set_fault(), soap_set_validation_fault(), soap_string_in(), and soap_wstring_in(). Definition at line 1743 of file stdsoap2.h. Referenced by soap_copy_stream(), soap_init(), and tcp_connect(). Definition at line 1746 of file stdsoap2.h. Definition at line 1744 of file stdsoap2.h. Definition at line 1745 of file stdsoap2.h. Definition at line 1712 of file stdsoap2.h. Referenced by http_parse_header(), http_post(), http_response(), soap_array_begin_out(), soap_attachment(), soap_code_list(), soap_dateTime2s(), soap_double2s(), soap_element(), soap_element_start_end_out(), soap_envelope_begin_out(), soap_float2s(), soap_get_header_attribute(), soap_get_mime_attachment(), soap_long2s(), soap_LONG642s(), soap_match_cid(), soap_outliteral(), soap_outwliteral(), soap_peek_element(), soap_poll(), soap_putdime(), soap_puthttphdr(), soap_putmime(), soap_QName2s(), soap_send_fault(), soap_string_in(), soap_ULONG642s(), soap_unsignedLong2s(), soap_utilize_ns(), soap_value(), soap_wstring_in(), and tcp_connect(). Definition at line 1716 of file stdsoap2.h. Referenced by soap_element_begin_in(), soap_getelement(), soap_in_ArrayOf_USCORExsd_USCOREstring(), soap_in_ns2__checkRegExp(), soap_in_ns2__checkRegExpResponse(), soap_in_ns2__getDataResources(), soap_in_ns2__getDataTypeDef(), soap_in_ns2__getDataTypeDefResponse(), soap_in_ns2__getDataTypePattern(), soap_in_ns2__getDataTypePatternResponse(), soap_in_ns2__getDataTypeSynonyms(), soap_in_ns2__getDataTypeURI(), soap_in_ns2__getDataTypeURIResponse(), soap_in_ns2__getDataTypeURIs(), soap_in_ns2__getJavaLibraryVersionResponse(), soap_in_ns2__getLocation(), soap_in_ns2__getLocationResponse(), soap_in_ns2__getLocations(), soap_in_ns2__getLocations_(), soap_in_ns2__getMiriamURI(), soap_in_ns2__getMiriamURIResponse(), soap_in_ns2__getName(), soap_in_ns2__getNameResponse(), soap_in_ns2__getNames(), soap_in_ns2__getOfficialDataTypeURI(), soap_in_ns2__getOfficialDataTypeURIResponse(), soap_in_ns2__getResourceInfo(), soap_in_ns2__getResourceInfoResponse(), soap_in_ns2__getResourceInstitution(), soap_in_ns2__getResourceInstitutionResponse(), soap_in_ns2__getResourceLocation(), soap_in_ns2__getResourceLocationResponse(), soap_in_ns2__getServicesInfoResponse(), soap_in_ns2__getServicesVersionResponse(), soap_in_ns2__getURI(), soap_in_ns2__getURIResponse(), soap_in_ns2__isDeprecated(), soap_in_ns2__isDeprecatedResponse(), soap_in_PointerToArrayOf_USCORExsd_USCOREstring(), soap_in_std__string(), soap_inbyte(), soap_indateTime(), soap_indouble(), soap_infloat(), soap_inint(), soap_inlong(), soap_inLONG64(), soap_inshort(), soap_inULONG64(), soap_inunsignedByte(), soap_inunsignedInt(), soap_inunsignedLong(), soap_inunsignedShort(), soap_isnumeric(), soap_peek_element(), soap_putsizesoffsets(), and soap_set_fault(). Definition at line 1634 of file stdsoap2.h. Definition at line 1636 of file stdsoap2.h. Definition at line 1600 of file stdsoap2.h. Referenced by http_post(), http_response(), soap_array_begin_out(), soap_begin_recv(), soap_body_begin_out(), soap_check_result(), soap_element(), soap_element_null(), soap_element_ref(), soap_element_result(), soap_embed(), soap_embedded_id(), soap_envelope_begin_in(), soap_envelope_begin_out(), soap_fault(), soap_faultcode(), soap_faultdetail(), soap_faultstring(), soap_faultsubcode(), soap_init(), soap_is_embedded(), soap_peek_element(), soap_print_fault(), soap_puthttphdr(), soap_putindependent(), soap_putsizesoffsets(), soap_receiver_fault_subcode(), soap_recv_fault(), soap_sender_fault_subcode(), soap_set_fault(), soap_set_local_namespaces(), soap_set_receiver_error(), soap_set_sender_error(), and soap_sprint_fault(). Definition at line 1762 of file stdsoap2.h. Referenced by soap_dime_forward(), soap_end_recv(), soap_free_temp(), soap_init(), soap_resolve_attachment(), and soap_update_ptrs(). Definition at line 1828 of file stdsoap2.h. Referenced by soap_begin_recv(), soap_begin_send(), soap_copy_context(), soap_copy_stream(), soap_done(), soap_end_recv(), soap_end_send(), soap_flush(), soap_init(), and soap_recv_raw(). Definition at line 1829 of file stdsoap2.h. Referenced by soap_begin_recv(), soap_copy_stream(), soap_end_recv(), and soap_recv_raw(). Definition at line 1823 of file stdsoap2.h. Referenced by soap_begin_recv(), soap_begin_send(), soap_copy_stream(), soap_end_recv(), soap_end_send(), soap_flush(), and soap_recv_raw(). Definition at line 1830 of file stdsoap2.h. Referenced by soap_begin_send(), soap_copy_stream(), and soap_init(). Definition at line 1831 of file stdsoap2.h. Referenced by soap_begin_recv(), soap_copy_stream(), and soap_recv_raw(). Definition at line 1832 of file stdsoap2.h. Referenced by soap_begin_send(), soap_copy_stream(), and soap_end_send(). Definition at line 1826 of file stdsoap2.h. Referenced by http_parse_header(), soap_begin_recv(), soap_copy_stream(), soap_end_recv(), soap_init(), and soap_recv_raw(). Definition at line 1827 of file stdsoap2.h. Referenced by http_parse_header(), soap_begin_recv(), soap_begin_send(), soap_copy_stream(), soap_end_send(), soap_init(), and soap_puthttphdr(). Definition at line 1825 of file stdsoap2.h. Referenced by soap_begin_recv(), soap_begin_send(), soap_closesock(), soap_copy_stream(), soap_end_recv(), soap_end_send(), and soap_init().